Whether you use your Android phone or tablet for business or pleasure, there’s a high chance that you use it to keep track of things you need to do. Rather than having to track down an app shortcut to launch a calendar tools, a widget can be used to show you the information you need at a glance; here we take a look at five of the best. Your calendar can be home to all manner of information, and it could include information that you need to be able to see quickly. If someone asks you if you are available to meet up on Thursday afternoon, you want to be able to check your upcoming schedule as quickly as possible. Android has a calendar built in, and it’s possible that your device has been customized with additional apps by the manufacturer. Whatever app you use to manage your schedule, it can be frustrating to have to hunt down the shortcut you need to launch the relevant app. By using a widget instead, you can gain instant access to the information you need. There are plenty of calendar tools and widgets to choose from, but not all are born equal. Some widgets are incredibly simply affairs that do nothing more than let you know what’s coming up in the next 24 hours. Others are far more versatile and offer customization options and the ability to create a new appointment from the home screen. It is very difficult to pick out one particular widget and crown it as the best of the bunch — everyone has different needs, and what works for one person may not work for someone else. The following five widgets are a varied selection, so you should be able to find one that works for you. Simple is the name of the game here, but that does not mean that this is a widget that is short of options. Things get off to a great start thanks to the fact that there are six different widget sizes to choose from. It doesn’t matter if you have a hectic schedule as the widget is scrollable — so you can have a fairly small widget and still gain access to everything you need to see. Simple Calendar Widget can give you a detailed overview of what’s coming up on your schedule. After installing Simple Calendar Widget, you’d be forgiven for thinking that there is no way to customize it. In fact,there are two: tap the right hand edge of the widget, or launch the dedicated configuration app. Here you’ll find that there are in fact a wealth of options to work with. With four different widgets to choose from, Simple Calendar Widget can be tweaked to suit your needs. You can choose which calendars should be displayed, how many days should be visible, choose from a number of different skins and configure calendar and task settings. If you don’t want to be overwhelmed with events you can opt to limit the number that are displayed. This is where the widget really shines. It is delightfully simple to use, but surprisingly feature-packed. Download Simple Calendar Widget from Google Play. For fans of the “keep it simple” philosophy, Month Calendar Widget is great. There are only two standard widget sizes to choose from here — 3 x2 and 4 x 3 — and you are presented with little more than a display of the current month. You can scroll back and forward through time using the arrow button, but sadly it is not possible to swipe back and forth. Keeping it beautifully simple, Month Calendar Widget keeps its features to a minimum. That really is it in terms of functionality. The widget does not display a list of upcoming appointments, or even link to your preferred calendar app when you click it. It is meant to be nothing more than a stylish way to not only check the current date, but also to be able to check the day or date in the past or going forward. Simple and effective. Download Month Calendar Widget from Google Play. There are lots of options to choose from here, and while some of the customization options are limited to the paid version of the app, the free version still has a lot to offer. There are multiple styles of widget to choose from giving you the option of seeing everything from a simple list of upcoming events to a detailed hour by hour breakdown of your day. Some of DigiCal Calendar & Widgets’ options are limited to the paid version. It is possible to display up to two weeks into the future which gives great scope for planning ahead, and when you tap an entry on the calendar you are able to edit it straight away — there’s no need for any further navigation. 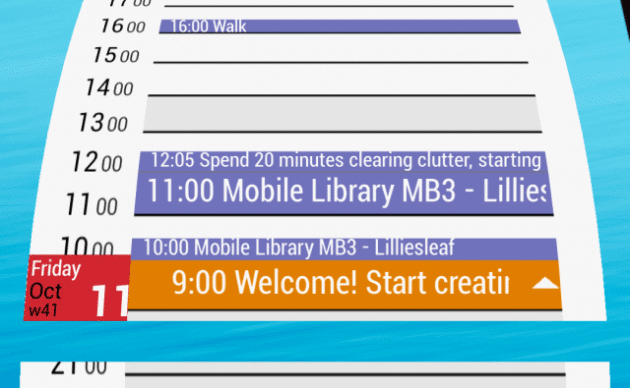 The ability to create new event directly from the widget is a welcome inclusion. Download DigiCal Calendar & Widgets from Google Play. As you might expect from a widget that include the word “zen” in its name, the focus here is on simplicity. There are two widgets to choose from — the first is a scrolling day-at-a-time schedule view, while the second is a todo list view that splits your day up into events that have been completed and those that are still to come. Clean and uncluttered, ZenDay provides you with a clear overview of your appointments. In both cases, creating new entries is just a tap away, and you can browse through your upcoming schedule in full using ZenDay’s unique 3D view. ZenDay’s unique 3D view is unusual but interesting. The widgets themselves have no options for you to configure, but everything work as you would expect from the offset, so this is not a problem. Another widget where simplicity is the order of the day, Smooth Calendar does not take over your homescreen with a large, busy calendar. Instead, you are presented with a small, stylish widget that can be used to display just a few appointments at a time — perfect for anyone who does not have too busy a schedule. You can run multiple instances of Smooth Calendar so you can view different things at the same time. A particularly handy feature of Smooth Calendar is that fact that it is possible to run multiple instances of the widget at the same time. Each can be configured with its own settings, so you could have one that shows what is coming up today and another that shows tomorrow. Smooth Calendar is a great option for anyone who doesn’t want to have to fiddle with lots of settings. There are a plethora of options. Smooth Calendar may look basic to start with, but it can be perfectly tailored to suit your needs. While it is not possible to create new events from within Smooth Calendar you can configure your preferred calendar to open when you tap the widget — and coupled with the multi-widget option, there is scope for great customization. Download Smooth Calendar from Google Player. Each of these widgets offers its own degree of flexibility, and we’re sure you’ll find something that will help you in this selection. Did we miss one of your favorite widgets? Or have you learned something new? Share your thoughts in the comments.